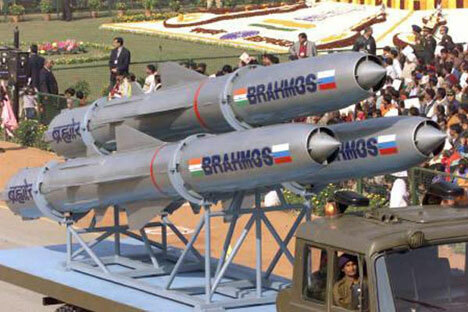 India and Russia spar over BrahMos missile air version. The India-Russia plan to fit the BrahMos supersonic cruise missile on their Sukhoi aircraft is in trouble with the two sides sparring over who will foot the bill to modify the fighter jet's design, Hindustan Times reported. The shadow boxing, which is being carried out behind closed doors at the moment, is over Russia's demand for additional costs to rework the Su-30 fighter aircraft's design so that a remodelled, lighter BrahMos missile can be integrated onto it. Though BrahMos Aerospace managing director Apathukatha Sivathanu Pillai denied there were any difference of opinion between the joint venture partners on who will fit the bill for the Sukhoi modification, he did admit that price negotiations were in progress, according to Hindustan Times. "There is no dispute with them. Any discussion takes time. We are also looking at our own design. We will not delay the project," Sivathanu Pillai said. Noting that India had asked Russia to do the redesigning of the Sukhoi aircraft as it was a platform from their stable and they were the primary developers of the aircraft, Pillai said: "But we also have the capability to do the redesigning and if need be, we can also do that." Defence Ministry sources have indicated that Bangalore-based Hindustan Aeronautics Limited (HAL), that is currently producing the Su-30MKI under license from the Russians for the Indian Air Force, has been asked to submit a plan for the work and they have carried out a preliminary study on the redesigning so that India could do it alone if the Russians pressed hard for more money, Hindustan Times reported. Sukhoi itself will need to be modified by strengthening its airframe so it can carry BrahMos, which will be the heaviest of all its missile weighing 2,500 kg. The missile is capable of carrying a 300-kg conventional warhead. According to Hindustan Times, the air force version will also have some changes in its design to suit the "drop and fire" mechanism that would be employed by the Sukhois, which will have the capability to carry one of the BrahMos in its underbelly. The current order for BrahMos missiles, Pillai said, was worth $4 billion, a profitable enterprise considering that the total investment from India and Russia for the project was only $300 million. India shared 50.5 percent of the cost and Russia 49.5 percent. "Both the Indian and Russian governments have approved exports. In fact, all the three services... army, navy and air force... have signed agreements accepting export of the BrahMos missile," he said. But the only request of the Indian government and the armed forces was that the joint venture first meet their requirements before export orders are considered, Hindustan Times reported.